Few have lived as unwaveringly in their dedication to the bodhisattva ideal to assist all beings in reaching enlightenment as Chatral Sangye Dorje Rinpoche. 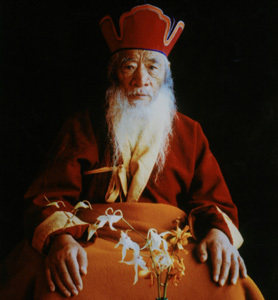 Chatral Rinpoche exemplifies the bodhisattva vow, as evidenced in the vast scope of his compassionate actions to help both humans and animals. As a result, he is deeply beloved and revered throughout the Himalayan region by people of all faiths. In the 1960’s, under the Bodhi Tree in Bodh Gaya, moved by great compassion, Rinpoche took a vow to never eat meat. Over the ensuing decades he has become perhaps the most vocal proponents of adopting a vegetarian diet in the Tibetan Buddhist world. Rinpoche practices what he preaches: he maintains a strict vegetarian diet and requires a vegetarian lifestyle in all of his monasteries and retreat centers, and permits only vegetarian meals during all ceremonies over which he presides. Attributing his vigorous health to his vegetarian diet, Rinpoche is now over 100 years old, and dedicates each and every day to acts of compassion without growing tired. During his famous yearly trips to Calcutta, he has saved the lives of countless beings by freeing truckloads of fish into the Ganges River, where fishing has been temporarily prohibited, praying for each and every one. The fish are thus given the chance to live in peace and most importantly, meet with the holy dharma as a cause for a higher rebirth and enlightenment in a future life. He has also practiced tsethar on behalf of innumerable cows, goats and other animals. 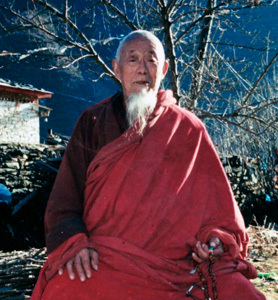 Born in 1913, Chatral Rinpoche is one of the few living disciples of the great master Khenpo Ngagchung and is widely regarded as one of the most highly realized Dzogchen yogis alive today. He has studied under the guidance of over 100 masters from many traditions in Tibetan Buddhism, including the renowned masters Dudjom Rinpoche, Jamyang Khyentse Chokyi Lodro, and the famed dakini Sera Khandro. He is the heart disciple and Vajra Regent of the late Dudjom Rinpoche and is the chief lineage holder for three main traditions in the Nyingma School: Dudjom Tersar, Sera Khandro and Longchen Nyingthig and in particular, the lineage that descends through Jigme Lingpa’s heart son Jigme Gyalwe Nyugu and then on to Patrul Rinpoche. In 1947, Chatral Rinpoche was the head spiritual master for Regent Reting, the political ruler of Tibet. Renouncing the privileges and fetters that accompany lofty titles, he has always preferred to wander as a humble yogi, often dressed as a beggar, living in simple dwellings far from the distractions of fame and fortune. With no possessions weighing on his spirit or mind, he has been truly free to practice his bodhisattva vows. Relentless in his study and practice, he spent many years in solitude, meditating in scores of caves in Tibet, insisted on traveling by foot rather on the back of an animal, happily accepting the irregularity of food supplies and other comforts as components inherent to his lifestyle. Today, Rinpoche lives in Parphing, Nepal, near a sacred site of Guru Padmasambhava. He is attended by his consort, Sangyum Kamala and two daughters, Semo Saraswati and Semo Tara Devi. In his lifetime, Venerable Khenpo Chodrak Rinpoche performed fish release many times. On one occasion after he bought several truckloads of fish near the Minyak Lhagang monastery, 60 monks, each carrying two buckets full of fish, walked for seven hours during the night along a steep mountain trail, finally releasing the fish safely into a mountain lake. Rinpoche also performed tsethar on behalf of multitudes of fish and birds in China, praying for each one’s well-being and rebirth into a higher realm so that they could have the opportunity to reach enlightenment. 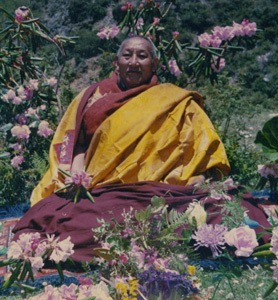 Also known as Tsara Chödrak, Rinpoche was born in Minyak, Tibet in 1916 and passed away in 2005. Rinpoche studied at the Dzogchen and Zhechen monasteries, with Dzogchen Khenpo Thupten Nyendrak, Khenpo Ngawang Norbu, Khenpo Pema Tsewang, Khenpo Sonam Wangyal, and Khenpo Yeshe Dargye. As a result of his accomplishment in his studies, he was awarded the title of Khenchen. He also received Dzogchen teachings from the fifth Dzogchen Rinpoche Thupten Chökyi Dorje, and his incarnation the sixth Dzogchen Rinpoche Jikdral Changchub Dorje, Drukpa Kuchen Choying Rangdrol, Dzogchen Kongtrul, Khenpo Kunpal, Khenpo Jigme Yönten Gonpo, and his three main root teachers, Pema Tekchok Loden, and Zhechen Kongtrul Rinpoche. After 1959, Rinpoche spent many years in prison, where he practiced the dharma in secret, had many visions, and received teachings and empowerments. Following his release from prison he secretly transmitted dharma teachings in Tibet until the 1980’s when there was more freedom to teach openly. In Kham, he established a shedra and retreat center, Lhagang, which over the decades, has grown to become a vibrant center of learning in eastern Tibet. During his numerous visits to Gyalrong, Khenpo Chodrak, also greatly inspired the local people to renew their long-held faith and commitment to dharma practice. There he established a shedra at Tsamney Monastery. A widely respected scholar and Longchen Nyingtig lineage holder, Khenpo Chodrak’s legacy endures, with many new shedras in eastern Tibet attributed to his influence. Without his and numerous other great masters’ undaunted efforts to keep the dharma alive in Tibet after the Chinese invasion in 1959, Tibetan Buddhism may not have survived inside Tibet. A strong proponent of vegetarianism, Tarthang Tulku emphasizes human responsibility in the compassionate and loving guardianship of animals. As such, he abstains from eating meat, and his dharma centers in America, Europe and South America also adhere to a strict policy of vegetarianism. Tarthang Tulku once said, “[a]ny pleasure I ever found in eating meat could never compare to, or justify, the unimaginable suffering that occurred to produce it.” He is a regular sponsor of annual animal liberations in Tibet. Born in 1935, Tarthang Tulku is one of the few remaining Tibetan lamas to receive traditional Buddhist training under the great masters. He received blessings, teachings, and initiations from the greatest Nyingma masters of the 20th century: Jamyang Khyentse Chokyi Lodro, Zhechen Kongtrul, Adzom Gyelsey, Bodpa Tulku, and others, altogether 31 teachers. Under their guidance, he trained intensively in the highest teachings of the Nyingma tradition. Following his root guru, Jamyang Khyentse Chokyi Lodro, Rinpoche fled Tibet in 1958 to continue his studies in India. In 1963, the late Dudjom Rinpoche appointed Rinpoche to represent the Nyingma tradition as a research fellow at Sanskrit University in Benares. During this period, he established one of the first Tibetan printing presses in exile, thus embarking on a lifelong endeavor to preserve and freely distribute sacred Tibetan art and texts. Six years and some twenty publications later, he left for America to bring Dharma to the West. In 1969, Rinpoche established the Tibetan Nyingma Meditation Centers in Berkeley, California, a mandala of organizations whose collective goal is to support the preservation of the Tibetan culture and transmit Buddhist teachings to the West. Over the next 44 years, he worked tirelessly to realize a vision of wisdom in action that encompasses over twenty organizations in the U.S. and abroad. His efforts have had a momentous impact on the transmission of Dharma to the West and its restoration in Asia. Rinpoche’s foremost contributions to Tibetan Buddhist culture include the creation and sponsorship of the World Peace Ceremony in Bodh Gaya, the largest annual Tibetan ceremony in exile; the gift of over 3.7 million sacred Tibetan texts to monasteries and lay practitioners of all four schools of Tibetan Buddhism, which has led to the replenishment and creation of libraries for 3,300 Tibetan dharma centers in exile; the creation and sponsorship of the Tipitaka Chanting Ceremony in Bodh Gaya, an annual gathering of the Theravadin sanghas of nine southeast Asian countries for the first time in 700 years; support for the educational and basic needs of several important monasteries of the Nyingma tradition in Tibet, and the creation of the Odiyan Retreat Center, a monumental Tibetan Buddhist sanctuary in northern California. The great yogi Jigme Tengye Rinpoche of the Gyalrong region made considerable efforts to revive the traditional practice of tsethar, or animal liberation, in Tibet, in his lifetime. Whenever anyone sought his advice, Rinpoche unfailingly advised tsethar as the most powerful remedy for a whole host of problems ranging from illness to worries to having a child – for it is the best possible practice to bring auspicious circumstances, longevity and success into one’s life. Born in the Gyalrong region of Tibet at the turn of the 20th century, Jigme Rinpoche entered the monastery at a young age. He was a devoted disciple of many of the most accomplished masters of his time, including, Lama Orgyen Yongdzin Rinpoche, Ah Pang Terton, Dodrup Tulku Riglo, Yukhok Chatralwa Chöying Rangdrol, Adzom Gyalsey, and the late Alak Zankar Rinpoche, incarnation of Do Khyentse Rinpoche. He received a wide scope of sutra and tantra teachings and empowerments, and became a lineage holder of Dzogchen and Chod practice teachings. He was a life-long, dedicated practitioner of the Longchen Nyingthig, Yeshe Lama, Khyad par Khrid yig and ‘Zin pa Rang Grol practice traditions. A master yogi and renunciate, Jigme Rinpoche also had far-reaching knowledge of sadhana rituals, geomancy, calligraphy and astrology. In his youth, following his pilgrimage to the Jowo in Lhasa and the holy places of Guru Rinpoche in central Tibet, Jigme Rinpoche spent over ten years on retreat in caves and other remote locations in eastern Tibet. Subsequently, he dedicated much of his life to keeping traditional dharma practice alive in Tibet by transmitting a wide spectrum of Nyingma teachings to many Dharma students. In the 1980’s, he worked vigorously to reawaken the Dharma in the Gyalrong region of Tibet by rebuilding several monasteries including the Tsamney, Mangkur and Alor monasteries, the latter two of which were located and established auspiciously with the guidance of Tibetan geomancy. With the help of the late Venerable Khenpo Chodrak, he established a shedra in the Tsamney Monastery. 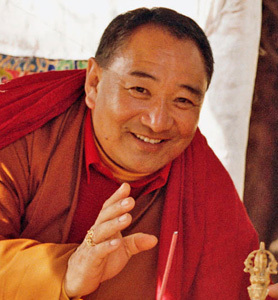 Though Jigme Tengye Rinpoche passed away in 2006, he is still greatly revered in Gyalrong for his tireless efforts to provide opportunities for lay and ordained practitioners to study and practice the dharma in their homeland.